Blogging is 21st century thought leadership, which is table stakes in the Knowledge Economy. Your thoughts represent and “scale” you, so they help you to connect with people with whom you can collaborate to do meaningful things. Moreover, blogging software is the ideal heart of your social business ecosystem because blogs’ content is much easier to find than websites’. In addition, all blogging platforms are cloud-based and have RSS feeds for republishing, so it’s super easy and efficient for you to re-share your blog posts elsewhere—on LinkedIn, for example—automatically. By the way, this post applies equally to individual executives and firms. It’s especially poignant to B2Bs. Please feel free to skip this section if you have no mental resistance to blogging. Based on CSRA’s experience mentoring executives and knowledge workers in all kinds of social network/blogging activities, I totally appreciate the mental resistance most people have to writing for the public. But blogging can be anything you want it to be— as long as you attract potential relationships and business once you’ve built enough trust with them. You don’t even have to be a good writer, although it helps. Not required, though. The good news is, blogging is much easier than you think. But you have to get through the mental resistance. It’s okay to be nervous about looking foolish online, but the fear is far greater than the reality. Know this, though: your risk is way higher when you are invisible. Your invisibility is a near certainty if you aren’t hitting people’s screens. Think about it. Wrestle the mental resistance to the ground. Use the Blogging: Quick Launch Guide to set up a blog if you don’t have one. Don’t let this get in your way; get help if you need it. By the way, blogging platforms all have controls just like office applications, so they are easy to use at a basic level. Under the hood, though, they are CMSs (content management systems), so very sophisticated and robust. The Quick Launch Guide explains how to get started very easily, by writing short posts. Here are some examples here on the Executive’s Guide to Social Networks (we do them, too! ): Google+ | Facebook. Get used to posting; most people find it’s easier to make a schedule and commit to it. Make it realistic. Once you have established a routine and have about a dozen posts under your belt, move to Step Two. LinkedIn has two “Apps” that automatically publish the title and first few sentences of your blog posts (link included, of course! ), right in your LinkedIn Profile. Check out this page, and look for the WordPress app and the Bloglink app. Look on my Profile to see it (at the bottom). Obviously, the WordPress LinkedIn App only works with WordPress blogs, but Bloglink will republish any RSS feed. You can install both of them if you have more than one blog. Among most B2B and even B2C executives, Twitter is still kind of racy. Many have had an account at some point, but few are active. There are many approaches to Twitter, but I mention it here because every blogging platform has plugins that automatically tweet to promote your posts. If you invest a little time creating a high-value Twitter network, they will appreciate this. Head over to the Executive’s Guide to Twitter for how-to guides and our posts that explore Twitter’s enterprise value proposition. Share your most relevant posts in LinkedIn Groups, where you can use them as conversation starters. See Triple the Value of Your LinkedIn Network.. for how to use Groups well. There are numerous apps to publish your blog posts to Facebook. RSS Graffiti is one of the main ones. All of these plugins and apps use RSS. As I wrote in Blogging/Quick Start, you could use categories and/or tags to publish only certain topics to different places. If you’re interested in that, ask about it in comments below. When you’ve got a few nodes going, move to Step Three. Or break the rules and do Step Three first ;^) – whatever works for you. A “blogroll” is a (usually) short list of people whom you read frequently. If you’re in B2B, they probably won’t be too popular with mainstream people or press. I can guarantee that there are fantastic people writing amazing things about your business or cultural interests. Once you find them (select for complementary cultural/social compatibility, of course), they will give you great insights and ideas, and you can create a network around your blog because they will undoubtedly appreciate what you write, too. You need to have a vision for what you’re looking for; I realize that probably sounds silly, but think about it. What posts/articles do you want to see from your blogroll? Papers? Slide decks? Blog posts? What topics would they address? Write these down. Experiment by popping the most unusual keyword combinations into Google. Play with this. Aim to get a few thousand or few hundred results (four figures max). Then constrain results by using Google’s blog search (it’s under the “More” dropdown in the main horizontal search bar). Pick the top five industry journals or publications that have public comments. Who comments most often about the topics in which you’re interested? Search your LinkedIn Connections. In LinkedIn Advanced Search, pop in some of the keywords that are working on Google and add the word “blog” to the keyword field. 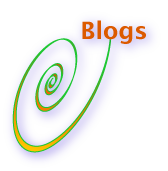 Realize that most bloggers have blogrolls, so when you find a good blog, look at its blogroll. The key is finding the first relevant blog; it will lead you to other bloggers. Aim for 3-5 blogs in your blogroll to start with, and plan to expand/tweak your ‘roll later. Once you have your URLs, follow your blogging platform’s help to put them into the sidebar. In WordPress, the core functionality is accessible in the Dashboard (management console) under “Links.” You can name each blog title and include its link. Most WordPress themes’ defaults have the blogroll in the sidebar, usually with a bunch of WordPress links in it. You can delete those, or make them invisible. Don’t hesitate to use comments under this post to post techie questions. Comment on your blogroll’s posts that are relevant to your topics and readers. Your comments should add value to the post by asking a question or emphasizing to debating a point. Comments are usually brief, but you can wax philosophical if you want, as long as you’re considerate and relevant. Asking the blogger, or another commenter, a follow-up question is a great idea. Sharing your thought (setting the context) before asking a question is even better. Make sure you comment fairly regularly; it’s better to comment more often on fewer blogs than once in a while on 20 blogs. After a while, other bloggers will start commenting on your posts, too, which will help your readership and help Google find you based on your keywords. Google prizes interactivity, too. It ranks way higher than static text. If you know that your desired readers are committed to that publication. Study others’ comments to assess whether the publication is a good investment of your time. Usually, it’s a far less personal environment in which you’ll have a harder time distinguishing yourself, so the trade-off is “I’m part of a big brand” vs. less attention and influence. For me it’s a dealbreaker if the MSM doesn’t let me register and comment without moderation (in other words, my comments appear immediately). Otherwise, the trust level is too low. I tried to make this short, but I needed to make it complete enough to be actionable. Please let me know how I did and help me address lapses by commenting. I hope you understand how important this is. It’s getting more important every quarter. Don’t let the digital knowledge divide happen to you. Very good tips for blogging. I really enjoyed reading them.